Wiener Städtische Versicherungsverein is the main shareholder of Vienna Insurance Group (VIG) – the leading insurance group in Austria and Central and Eastern Europe. In this function, Wiener Städtische Versicherungsverein is concerned with key strategic matters within the Group. One of Wiener Städtische Versicherungsverein’s major responsibilities is to preserve and safeguard the independence of the listed holding company. As the main shareholder of VIG, which comprises more than 50 Group companies in 25 European countries, Wiener Städtische Versicherungsverein assumes responsibilities in areas far beyond purely commercial matters – responsibility towards the 25,000 or so employees who work for the Group as well as society as a whole. It fulfils this responsibility by means of targeted sponsorship and support for social, arts and cultural activities, and this commitment extends well beyond Austria’s borders, with a strong focus on the Central and Eastern European countries in which the Vienna Insurance Group has a presence. The history of Wiener Städtische Versicherungsverein, which now stretches back almost 200 years, has been shaped by difficult economic times and periods of social upheaval. The company has a fascinating past, and the story of its foundation is particularly interesting. Georg Ritter von Högelmüller, an officer in the Austro-Hungarian army, had the idea of setting up an insurance company in 1803. However, his vision did not become a reality until 24 December 1824 – the date on which Wiener Städtische Versicherungsverein was officially established, more than 20 years later. It took so long to gain approval for the formation of the company – which is today the main shareholder of the leading insurance group in Central and Eastern Europe – because of the democratic philosophy which pervaded the abbeys and monasteries that were involved in setting up Wiener Städtische Versicherungsverein. In a nutshell, during the Metternich era, the foundation of the company was considered as an act of pure defiance. 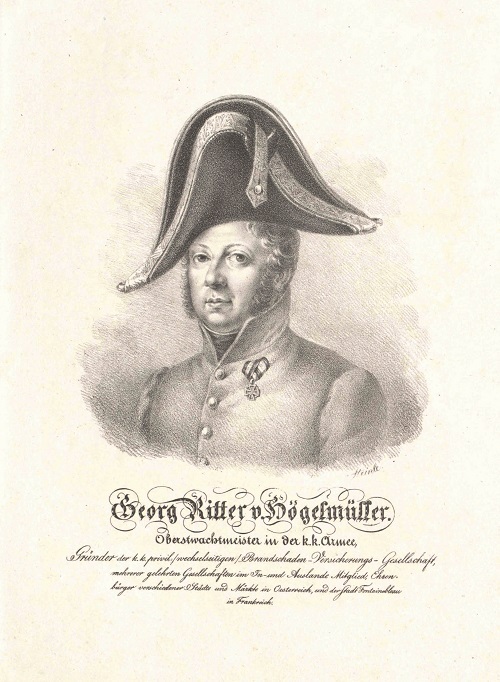 Georg Ritter von Högelmüller establishes the private mutual fire insurance company Wechselseitige k.k. priv. Brandschaden-versicherungsanstalt. The membership comprises 364 prominent figures, including princes, counts, barons and industrialists, as well as abbeys and monasteries in Klosterneuburg, Göttweig, Melk and other locations in Austria. Allgemeine wechselseitige Capitalien- und Renten-Versicherungsanstalt, Austria’s first provider of life insurance, opens for business following an initiative by mathematics professor Josef Salomon. Its name is later changed to Janus wechselseitige Lebensversicherungs-Anstalt. To mark the Emperor's 50th jubilee, on 11 February 1898 Vienna City Council led by Dr. Karl Lueger resolves to establish the Städtische Kaiser Franz Joseph-Jubiläums-Lebens- und Renten-versicherungs-Anstalt insurance company to provide life, pension and disability insurance. The new company brings together three predecessor companies, which were established in 1824, 1839 and 1898. The serving Mayor of Vienna is appointed chairman of Wiener Städtische’s supervisory board by law. The links between the governing bodies of Wiener Städtische and Vienna City Council are ultimately cut on the initiative of Helmut Zilk, Mayor of Vienna from 1984 to 1994. Following the fall of the Austro-Hungarian Empire, Städtische Kaiser Franz Joseph-Jubiläums-Lebens- und Rentenversicherungs-Anstalt is renamed Gemeinde Wien – Städtische Versicherungsanstalt. Gemeinde Wien – Städtische Versicherungsanstalt joins forces with Wechselseitige Brandschaden und Janus allgemeine Versicherungs-Anstalt auf Gegenseitigkeit in 1938. During World War Two, the Nazi Party dissolves all church provident savings associations. Despite the human and economic cost of these dark times, which also take their toll on Wiener Städtische Versicherungsverein, the close relations between the company and the Catholic Church strengthen. Wiener Städtische Versicherungsverein does not give in to demands by the Nazi Party to discontinue its provision of health insurance for members of the clergy. When the war comes to an end, a small group of 40 to 50 employees begins the process of rebuilding the devastated company. The first meeting of members takes place in 1947 and the company is renamed Wiener Städtische Wechselseitige Versicherungsanstalt. The Ringturm tower opens on 14 June 1955, about one month after the signing of Austria’s new state treaty. Vienna’s first high-rise office block, the building is a symbol of modernity as well as Austria’s recovery and economic revival. The company becomes the majority shareholder in Donau Allgemeine Versicherungs-Aktien-gesellschaft. This lays the foundation for the formation of the Vienna Insurance Group and the multi-brand strategy it still systematically pursues today. Wiener Städtische Wechselseitige Versicherungsanstalt becomes a holding company and is renamed Wiener Städtische Wechselseitige Versicherungsanstalt – Vermögensverwaltung. All insurance operations are spun off to Wiener Städtische Allgemeine Versicherung Aktiengesellschaft. This comes about two years after the company enters the insurance market in former Czechoslovakia by taking a stake in the newly formed Kooperativa. The company is floated on the Vienna Stock Exchange. No ordinary shares are issued, only preference shares, and 11 percent of the company’s stock is in free float. The company pursues an aggressive stock market strategy: Günter Geyer, former CEO of Wiener Städtische Allgemeine Versicherung AG and now Chairman of Wiener Städtische Versicherungs-verein’s Managing Board, initiates a large capital increase. The company taps the international capital markets to secure the funds necessary for continued growth. Preference shares are converted into ordinary shares in preparation for the capital increase. Following a stock split, the company’s shares are listed on the Vienna Stock Exchange’s ATX index in September 2005. After the introduction of the Vienna Insurance Group umbrella brand, in 2008 the company takes over s Versicherung, the insurance arm of Erste Group Bank AG. In the course of the takeover a long-term distribution agreement is concluded with Erste, beginning a successful partnership that is still going strong today. On 3 August 2010, Austrian insurance operations and the Group’s international activities are separated. That same year, Wiener Städtische Versicherungsverein is renamed Wiener Städtische Wechselseitiger Versicherungsverein – Vermögensverwaltung – Vienna Insurance Group. Today it owns approximately 70 percent of VIG’s shares.